Nearly one-quarter (23.8 percent) of the 70.9 million children under the age of 17 in 2009 had at least one immigrant parent. Regardless of whether or not Congress takes decisive action on immigration reform in the near term, immigration will long remain a critical issue due to the fact that it has a profound impact on the U.S. economy and intersects with other public policy areas such as health care, education, the labor market, and national security. Where are immigrants primarily from? How many immigrants come each year? How many are already here? How many became U.S. citizens last year? Do they have health insurance? Where do they live? How many children live in immigrant families? How large are illegal immigration flows, and how has the government responded? This Spotlight brings together resources from the Migration Policy Institute (MPI); the U.S. Census Bureau's 2009 American Community Survey, 2000 decennial census, and 2009 Current Population Survey; the U.S. Departments of Homeland Security and State; and Mexico's National Population Council (CONAPO) and National Institute of Statistics and Geography (INEGI). How many immigrants are in the United States today? What were the top source countries with the largest share of immigrants in 2009 compared with those in 1960? How many immigrants are in the United States today? Did it change compared to the previous years? According to the Census Bureau's 2009 American Community Survey, the U.S. immigrant population was 38,517,234, or 12.5 percent of the total U.S. population. The number of foreign born living in the United States increased by 1.5 percent (about 556,000 people) between 2008 and 2009. In general, the number of immigrants living in the United States remained virtually flat in 2007, 2008, and 2009. But the data show that immigration may be on the upswing again after the number of foreign born fell by 100,000 people between 2007 and 2008, from 38,059,694 to 37,960,935. While this was not a conspicuous change relative to the overall size of the immigrant population, the drop was in sharp contrast with the rapid increase in the immigrant population — about 1 million per year — recorded during the last two decades. In this case, what could be seen as "no change" was in fact a fairly substantial change indeed. For background on the American Community Survey, see the Census Bureau website. Data on the nativity of the U.S. population was first collected in the 1850 decennial census. That year, there were 2.2 million foreign born in the United States, 9.7 percent of the total population. Between 1860 and 1920, immigrants as a percentage of the total population fluctuated between 13.0 and 15.0 percent, peaking at 14.8 percent in 1890 mainly due to European immigration. By 1930, immigrants' share of the U.S. population had dropped to 11.6 percent (14.2 million individuals). The share of foreign born in the U.S. population continued to decline between the 1930s and 1970s, reaching a record low of 4.7 percent in 1970 (9.6 million individuals). However, since 1970, the percentage has risen rapidly, mainly due to large-scale immigration from Latin America and Asia. In 1980, according to the Census Bureau, the foreign born represented 6.2 percent (14.1 million individuals) of the total U.S. population. By 1990, their share had risen to 7.9 percent (19.8 million individuals) and, by the 2000 census, they made up 11.1 percent (31.1 million individuals) of the total U.S. population. As of 2009, immigrants comprised 12.5 percent (38.5 million) of the total U.S. population. See the figure Size of the Foreign-Born Population and Foreign Born as a Percentage of the Total Population (1850 to 2009) in the MPI Data Hub. Mexican-born immigrants accounted for 29.8 percent of all foreign born residing in the United States in 2009, by far the largest immigrant group in the United States. The Philippines accounted for 4.5 percent of all foreign born, followed by India and China (excluding Hong Kong and Taiwan) with 4.3 percent and 3.7 percent, respectively. These four countries — together with Vietnam (3.0 percent), El Salvador (3.0 percent), Korea (2.6 percent), Cuba (2.6 percent), Canada (2.1 percent), and the Dominican Republic (2.1 percent) — made up 57.7 percent of all foreign born residing in the United States in 2009. The predominance of immigrants from Mexico and Asian countries in the early 21st century starkly contrasts with the trend seen in 1960, when immigrants were more likely to be from European countries. Italian-born immigrants made up 13.0 percent of all foreign born in 1960, followed by those born in Germany and Canada (accounting for 10.2 and 9.8 percent, respectively). Unlike in 2009, no single country accounted for more than 15.0 percent of the total immigrant population in 1960. To view the top 10 source countries of immigrants to the United States in 1960, 1970, 1980, 1990, 2000, and 2009, visit the U.S. Historical Trends tool. Read our Spotlights on Mexican, Filipino, Chinese, Indian, and Vietnamese immigrants. Of the 38.5 million foreign-born population in the United States in 2009, 50.0 percent were female. The share of women declined slightly in the last three decades. Women accounted for 53.4 percent of the 14.1 million immigrants in 1980, 51.1 percent of the 19.7 million immigrants in 1990, and 50.2 percent of the 31.1 million immigrants in 2000. Of the 38.5 million foreign born in the United States in 2009, 40.5 percent entered the country prior to 1990, 27.9 percent between 1990 and 1999, and 31.6 percent in 2000 or later. Just over two in five (43.7 percent) immigrants in the United States in 2009 were naturalized U.S. citizens. The remaining 56.3 percent of immigrants included legal permanent residents, unauthorized immigrants, and legal residents on temporary visas, such as students and temporary workers. Of the 16.8 million naturalized citizens in 2009, 41.4 percent have naturalized since 2000, 28.0 percent naturalized between 1990 and 1999, 14.6 percent naturalized between 1980 and 1989, and 16.0 percent naturalized prior to 1980. Of the foreign born in the United States in 2009, 48.9 percent reported their race as white alone, 8.2 percent as black or African American alone, 23.9 percent as Asian alone, and 17.5 percent as some other race; 1.7 percent reported having two or more races. Note:The percentages might not add up to 100 due to rounding. In 2009, 46.9 percent of the 38.5 million (or 18.1 million) foreign born reported Hispanic or Latino origins. Of the 48.4 million people in 2009 who identified themselves as having Hispanic or Latino ancestry, nearly two-thirds (62.6 percent, or 30.3 million) were native-born U.S. citizens. The remaining 37.4 percent of Hispanics (or 18.1 million) were immigrants. In 2009, 52.0 percent of the 38.3 million foreign-born persons age 5 and older were LEP; practically the same as the share of 51.0 percent of the 30.7 million foreign-born persons age 5 and older in 2000. Which languages does the U.S. population* speak? In 2009, 80.0 percent of the entire U.S. population age 5 and older said they speak only English at home. The remaining 20.0 percent (or 57.1 million people) reported speaking a variety of foreign languages. ** Of them, Spanish was by far the most commonly spoken language (62.1 percent), followed by Chinese (4.6 percent), Tagalog (2.7 percent), French (including Cajun and Patois, 2.3 percent), Vietnamese (2.2 percent), German (1.9 percent), Korean (1.8 percent), Russian (1.5 percent), and Arabic (1.5 percent). Notes: * Refers to the 285.8 million people age 5 and older who resided in the United States at the time of the survey. ** These respondents might or might not speak English at home in addition to a foreign language. In 2009, there were 32.5 million immigrants age 25 and older. Of those, 26.8 percent had a bachelor's degree or higher, while 32.3 percent lacked a high school diploma. Among the 169.4 million native-born adults age 25 and older, 28.1 percent had a bachelor's degree or higher, and only 11.4 percent did not have a high school diploma. For more information on the characteristics of the foreign born in each of the 50 states, visit our 2008 ACS/Census data tool. For more information on the college education, see the November 2008 Spotlight College-Educated Immigrant Workers in the United States. The 2009 data on the foreign and native born are from the American FactFinder of the Census Bureau. How many Mexican-born workers were in the U.S. labor force in 2009? From which areas/regions do Mexican migrants residing in the United States come? In 2009, there were about 11,478,000 foreign born from Mexico residing in the United States according to the 2009 American Community Survey. Mexican immigrants accounted for 29.8 percent of all immigrants in the United States in 2009. Mexican immigrants were overwhelmingly concentrated in the West and Southwest in 2009, including California (37.5 percent), Texas (20.9 percent), Illinois (6.0 percent), Arizona (5.1 percent), and Georgia (2.4 percent). The foreign born from Mexico accounted for over half of the immigrant population in New Mexico (71.4 percent), Arizona (62.8 percent), Texas (60.3 percent), Idaho (51.9 percent), Arkansas (51.8 percent), and Oklahoma (50.8 percent). By contrast, Mexican-born individuals accounted for less than 3 percent of the state foreign-born population in Vermont (2.8 percent), Rhode Island (2.2 percent), Hawaii (2.1 percent), Maine (1.2 percent), and Massachusetts (1.2 percent). View a map of the Mexican born by state in 2008, including the metropolitan areas with at least 150,000 Mexican immigrants, on the MPI Data Hub. (Please note: Due to compatibility issues, you may need to download the map to your computer in order for it to load properly). About 71.3 percent of the 10.7 million immigrants from Mexico age 16 and older were in the civilian labor force in 2009 compared to 68.5 percent of the 36.3 million immigrants age 16 and older from all countries and 64.1 percent of the 204.7 million native born age 16 and older. According to Mexico's National Survey of Occupations and Employment (ENOE), the emigration rate from Mexico appears to have slowed recently from 10.8 migrants per 1,000 Mexican residents in spring 2007 to 8.4 per 1,000 Mexican residents in spring 2008 to 5.5 per 1,000 Mexican residents in spring 2009 and to 4.6 per 1,000 Mexican residents in spring 2010 (see Figure 1). The immigration rate to Mexico (i.e., the number of people who move to Mexico from abroad, who are overwhelmingly return migrants) remained relatively stable over the same period, fluctuating between 3.2 and 5.9 migrants per 1,000 Mexican residents. Note: ENOE asks Mexican households to enumerate any members of the household are who living abroad at the time of the interview. Accordingly, it does not capture the emigration of entire families where no member of the household remains in Mexico. Source: Mexican National Institute of Statistics and Geography, National Survey of Occupations and Employment, 2006 to 2010. The Mexican National Population Council (Consejo Nacional de Población, or CONAPO), tracks the number of Mexican-born U.S. residents according to their state of birth in Mexico. According to the only currently available estimate, in 2003, one-third of all Mexican-born migrants residing in the United States originated from just three states: Jalisco (13.7 percent), Michoacán (10.7 percent), and Guanajuato (9.3 percent) (see Map 2). In 1990, these three states accounted for 34.7 percent of Mexican migrants to the United States (16.8 percent from Jalisco, 10.5 percent from Michoacán, and 7.4 percent from Guanajuato). According to the most recent Survey of Migration on the Northern Border of Mexico (Encuesta de Migración en la Frontera Norte de México, or EMIF) from 2008, 14.2 percent of Mexican migrants headed toward the United States came from the state of Chiapas in southern Mexico. This is a significant change from 2000 when only 0.8 percent of Mexicans migrating to the United States came from Chiapas. The next largest origin states of Mexicans migrating to the United States in 2008 were Guanajuato (8.6 percent), Oaxaca (7.2 percent), Sonora (6.9 percent), and Michoacán (6.5 percent). While the share of Mexicans migrating to the United States from Sonora has declined (12.5 percent in 2000), the flows from Michoacán (13.9 percent in 2000) and Guanajuato (9.2 percent in 2000) have remained relatively stable, while the share of Mexicans migrating from Oaxaca has increased (2.7 percent in 2000). Note: EMIF is an annual sample survey of migration flows along Mexico's northern border region conducted by the Ministries of Foreign Affairs (SRE) and Labor and Social Affairs (STPS), the National Migration Institute (INM), the National Population Council (CONAPO), and the University of the Northern Border (COLEF) in Tijuana. It excludes Mexicans entering the United States by air, migrants under the age of 15, and non-Mexican nationals crossing the Southwest border. According to the 2009 American Community Survey, 51.1 percent of the 38.1 million civilian non-institutionalized immigrant population had private health insurance and 21.3 percent had public health insurance coverage; the rest (33.6 percent) had neither. In contrast, only 12.5 percent of the U.S.-born population had no health insurance. According to MPI estimates, immigrants accounted for 29 percent of the 46.6 million working-age adults and children under 18 with no health insurance in 2008. Of these 13.4 million uninsured immigrants, about half (6.8 million) were unauthorized immigrants, almost a third (4.2 million) were lawful permanent residents, and another 17 percent (2.3 million) were naturalized citizens. "Civilian labor force" — civilian persons age 16 and older who were either employed or unemployed in the week prior to participation in the American Community Survey. What share do the foreign born compose of the total U.S. civilian labor force? Of the 140.6 million workers engaged in the U.S. civilian labor force in 2009, immigrants accounted for 15.9 percent (22.5 million). Between 1970 and 2009, the percentage of foreign-born workers in the U.S. civilian labor force tripled, from 5.3 to 15.9 percent. Over the same period, the percent of foreign born in the total population grew from 4.8 to 12.5 percent. For more information on national and state-level shares of immigrants in the civilian labor force over time, see Foreign Born as a Percentage of the Total Population and of the Civilian Labor Force by State, 1980 to 2009. Of the 22.5 million civilian employed foreign born age 16 and older in 2009, 28.5 percent worked in management, professional, and related occupations; 24.6 percent worked in service occupations; 17.9 percent worked in sales and office occupations; 2.0 percent worked in farming, fishing, and forestry occupations; 15.5 percent worked in production, transportation, and material moving occupations; and 11.6 percent worked in construction, extraction, and maintenance occupations. Among the 118.1 million civilian employed native born age 16 and older, 37.1 percent worked in management, professional, and related occupations; 16.5 percent worked in service occupations; 26.6 percent worked in sales and office occupations; 0.5 percent worked in farming, fishing, and forestry occupations; 11.2 percent worked in production, transportation, and material moving occupations; and 8.2 percent worked in construction, extraction, and maintenance occupations. For more information on national and state-level trends regarding foreign-born workers, see the "Workforce" data sheet of the 2008 ACS/Census data tool. An immigrant household is defined as a household wherein either the head of the household and/or his or her spouse is foreign born. How many immigrants live in middle-class families? Nearly one-quarter (22.5 percent) of the 26 million immigrant households in the United States in 2009 were considered middle class, having a total annual income between $47,000 and $79,000, or roughly 75 to 125 percent of the median household income. Middle-class immigrant households were home to about 14.3 million individuals, 40 percent of whom were native-born U.S. citizens including the spouses and U.S.-born children of immigrants. Middle-class immigrant adults are, on average, slightly better educated than the overall immigrant adult population and tend to have, on average, a high school education and some post-secondary credential short of a bachelor's degree. For more information on the size, distribution and characteristics of middle-class immigrant households, please see the Migration Information Source Spotlight on Middle-Class Immigrant Households in the United States. What are the top five states in terms of the number of immigrants, share of immigrants in the total state population, absolute growth, and percent growth between 1990 and 2000 and between 2000 and 2009? What are the top 10 U.S. counties in terms of number of immigrants, share of immigrants in the total county population, absolute growth, and percent growth between 2000 and 2009? In 2009, the top five U.S. states by the number of immigrants were California (9,947,000), New York (4,178,00), Texas (3,985,000), Florida (3,484,000), and New Jersey (1,759,000). When classified by the share of immigrants in the total state population, the top five states in 2009 were California (26.9 percent), New York (21.4 percent), New Jersey (20.2 percent), Nevada (19.2 percent), and Florida (18.8 percent). Between 1990 and 2000, the five states with the largest absolute growth of the immigrant population were California (2,405,430), Texas (1,375,206), New York (1,016,272), Florida (1,008,227), and Illinois (576,786). Between 2000 and 2009, the five states with the largest absolute growth of the immigrant population were Texas (1,086,000), California (1,083,000), Florida (813,000), Georgia (343,000), and New York (310,000). Between 1990 and 2000, the five states with the largest percent growth of the immigrant population were North Carolina (273.7 percent), Georgia (233.4 percent), Nevada (202.0 percent), Arkansas (196.3 percent), and Utah (170.8 percent). However, between 2000 and 2009, the five states with the largest percent growth of the immigrant population were South Carolina (76.9 percent), Alabama (67.5 percent), Tennessee (67.1 percent), Delaware (64.9 percent), and Arkansas (63.2 percent). In 2009, the top 10 counties by the number of immigrants were Los Angeles County, California (3,514,000); Miami-Dade County, Florida (1,242,000); Cook County, Illinois (1,091,000); Queens County, New York (1,075,000); Harris County, Texas (1,009,000); Kings County, New York (936,000); Orange County, California (920,000); San Diego County, California (694,000); Santa Clara County, California (643,000); and Maricopa County, Arizona (636,000). When classified by the share of immigrants in the total county population, the top 10 counties in 2009 were Miami-Dade County, Florida (49.7 percent); Queens County, New York (46.6 percent); Hudson County, New Jersey (38.3 percent); Kings County, New York (36.5 percent); Santa Clara County, California (36.0 percent); Los Angeles County, California (35.7 percent); San Francisco County, California (34.1 percent); San Mateo County, California (33.9 percent); Bronx County, New York (31.9 percent); and Montgomery County, Maryland (30.8 percent). Between 2000 and 2009, the 10 counties with the largest absolute growth of immigrants were Harris County, Texas (252,000); Maricopa County, Arizona (195,000); Riverside County, California (169,000); Clark County, Nevada (168,000); Broward County, Florida (129,000); Dallas County, Texas (113,000); King County, Washington (104,000); San Bernardino County, California (102,000); Tarrant County, Texas (101,000); and Gwinnett County, Georgia (95,000). Between 2000 and 2009, the 10 counties with the largest absolute decline of immigrants were New York County, New York (-12,000); San Francisco County, California (-7,000); Passaic County, New Jersey (-6,000); Hudson County, New Jersey (-6,000); Arlington County, Virginia (-5,000); Santa Cruz Country, California (-3,000); Cuyahoga County, Ohio (-2,000); Chelan County, Washington (-2,000); Coryell County, Texas (-2,000); and Cumberland County, North Carolina (-2,000). Between 2000 and 2009, the 10 counties with the largest percent growth of the immigrant population were Lauderdale County, Mississippi (301.0 percent); Newton County, Georgia (294.8 percent); Wright County, Minnesota (293.0 percent); Barrow County, Georgia (290.8 percent); Henry County, Georgia (290.1 percent); Forsyth County, Georgia (280.0 percent); Delaware County, Ohio (277.0 percent); Christian County, Missouri (247.3 percent); Carver County, Minnesota (238.7 percent); and Loudoun County, Virginia (235.1 percent). Note: The above county-level data are from the 2009 one-year estimates of the American Community Survey, which, for confidentiality and sampling reasons, reports information only for 789 out of 3,141 U.S. counties. It is likely that the county rankings would be different if information on all counties were available. What are the top five states in terms of the percent growth of the number of children with immigrant parents between 1990 and 2000 and between 2000 and 2009? In 2009, there were about 16.9 million children age 17 and under with at least one immigrant parent. They accounted for 23.8 percent of the 70.9 million children age 17 and under in the United States. The 14.6 million second-generation children — those who were born in the United States to at least one foreign-born parent — accounted for 86.2 percent of all children with immigrant parents. The remaining 13.8 percent (2.3 million) were children born outside the United States to foreign-born parents. Between 1990 and 2000, the number of children age 17 and under with immigrant parents grew 59.7 percent from 8.2 million to 13.1 million. Between 2000 and 2009, the number grew 28.9 percent from 13.1 million to 16.9 million. Between 1990 and 2000, the number of first-generation immigrant children grew by 42.8 percent (from 1.9 million to 2.7 million). In contrast, the number of first-generation immigrant children declined 13.2 percent between 2000 and 2009 from 2.7 million to 2.3 million. The number of second-generation immigrant children has grown steadily since 1990. Between 1990 and 2000, the number of second-generation immigrant children grew 64.8 percent from 6.3 million to 10.4 million, and between 2000 and 2009, the number of second-generation immigrant children grew by nearly 40 percent from 10.4 million to 14.6 million. In 1990, children with immigrant parents were 13.4 percent of all children, compared to 19.1 percent in 2000 and 23.8 percent in 2009. The share of second-generation children among all children with immigrant parents has grown steadily from 77.0 percent in 1990 to 79.5 percent in 2000 and to 86.2 percent in 2009. In 2009, the top five U.S. states by the total number of children with immigrant parents were California (4,393,000), Texas (2,090,000), New York (1,430,000), Florida (1,139,000), and Illinois (762,000). These five states accounted for 60.4 percent of all children with immigrant parents residing in the nation in 2009. In terms of the share of children with immigrant parents, the top five states in 2009 were California (50.0 percent of all children in the state), Nevada (36.9 percent), New York (34.2 percent), Texas (33.8 percent), and New Jersey (32.9 percent). Between 1990 and 2000, the five states with the largest absolute growth of the total number of children with immigrant parents were California (1,282,400), Texas (643,000), Florida (384,500), New York (366,500), and Illinois (230,700). Between 2000 and 2009, the five states with the largest absolute growth of the total number of children with immigrant parents were Texas (668,300), California (386,500), Florida (295,000), Georgia (237,000), and North Carolina (183,000). Between 1990 and 2000, the five states with the largest percent growth of the total population of children with immigrant parents were Nevada (232.6 percent), North Carolina (223.7 percent), Georgia (193.8 percent), Nebraska (174.2 percent), and Arkansas (170.1 percent). Between 2000 and 2009, the five states with the largest percent growth of the total population of children with immigrant parents were Tennessee (120.3 percent), South Carolina (115.9 percent), Alabama (111.2 percent), North Carolina (109.0 percent), and Georgia (106.8 percent). Note: The government fiscal year runs from October 1 to September 30. All figures for annual flows given here are for the 2009 fiscal year (October 1, 2008, to September 30, 2009). How many foreigners (in all categories) obtained U.S. lawful permanent residence in 2009? In which categories did permanent immigrants enter in 2009? How many people applied for permanent immigration to the United States through the green-card lottery? What was the total number of nonimmigrant admissions to the United States in 2009? How did nonimmigrant admissions break down by visa category? How many visas did the Department of State issue in 2009? How many foreign born came as refugees and where were they from? How many foreign born came as asylees and where were they from? In 2009, 1,130,818 foreign nationals became lawful permanent residents (also known as green-card holders) according to the Department of Homeland Security's Yearbook of Immigration Statistics 2009. The total number represents a 2.1 percent increase from 2008 (1,107,126) and a 34.5 percent increase from 2000 (841,002). Of the 1.1 million new green-card holders, 463,042 (40.9 percent) were new arrivals who entered the country in 2009, and 667,776 (59.1 percent) were status adjusters. The status adjusters arrived in the United States in any year before 2009, but their green-card applications were approved during 2009. See the chart Legal Immigration to the United States: Fiscal Years 1820 to 2009. Of the 1.1 million new lawful permanent residents, 47.4 percent were an immediate relative of a U.S. citizen, 18.7 percent came through a family-sponsored preference, and 12.7 percent entered through an employment-based preference. Another 15.7 percent adjusted from a refugee or asylee status, and 4.2 percent were diversity-lottery winners. The number of newly arriving permanent immigrants under the employment-based preference reached the lowest level since 1999. Disaggregated by country of birth, 14.6 percent of LPRs came from Mexico. The top five countries of birth — Mexico, China (5.7 percent), the Philippines (5.3 percent), India (5.1 percent), and the Dominican Republic (4.4 percent) — accounted for 35.0 percent of all persons who received lawful permanent resident status in 2009. Persons born in the next five countries — Cuba (3.4 percent), Vietnam (2.6 percent), Colombia (2.6 percent), Korea (South and North) (2.3percent), and Haiti (2.1 percent) — made up another 12.9 percent of all lawful permanent residents, so that the top 10 countries of birth made up nearly half of the total (47.9 percent). 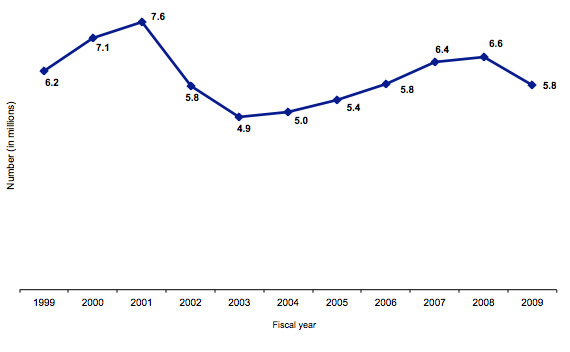 View the Department of Homeland Security's Yearbook of Immigration Statistics 2009. Temporary admissions of nonimmigrants to the United States more than quadrupled from 9.5 million in 1985 to 36.2 million (not including certain Mexicans and Canadians) in 2009. Between 2008 and 2009, however, temporary admissions of nonimmigrants declined 8.0 percent from 39.4 million to 36.2 million. This was the first year-to-year decrease in five years. An additional 126.4 million admissions were exempt from completing the I-94 arrival/departure form at the port of entry. These nonimmigrant admissions are from two groups: Canadians who travel to the United States for business or pleasure, and Mexicans who possess a nonresident Border Crossing Card (i.e., laser visa). Note: Nonimmigrant admissions represent the number of arrivals, not the number of individuals, admitted to the United States. The Department of Homeland Security only reports characteristics of nonimmigrants who have to complete an I-94 arrival/departure form. Similar to the past, temporary visitors (tourists and business travelers) accounted for an overwhelming majority of all arrivals. In 2009, they represented 89.8 percent (32.5 million) of all admissions to the United States. Of those, 27.8 million were tourist admissions and 4.4 million were business-traveler admissions. Tourist admissions declined 5.6 percent from 29.4 million in 2008, and business-traveler admissions declined by 21.6 percent from 5.6 million in 2008. Temporary workers and trainees, including H-1B "specialty occupation" workers, registered nurses, temporary agricultural workers, North American Free Trade Agreement (NAFTA) professional workers, treaty traders, and intracompany transferees, among others, accounted for 1.7 million arrivals (4.7 percent of total admissions); this figure includes spouses and children of all temporary workers and trainees. The number of temporary workers and trainee admissions declined by 12.6 percent from 1.9 million in 2009. Students who came to the United States to study at academic or vocational institutes, together with their family members, made up 2.6 percent (951,964) of total arrivals. The large majority (94.1 percent) were academic students, which reached an all-time record high — 4.2 percent higher than the number admitted in 2008 and 38.0 percent higher than the number of students admitted in 2000. The Department of State reports the number of visas issued to foreign nationals who wish to come to the United States for the purpose of traveling, conducting business, working, studying, and for other reasons. In 2009, the Department of State issued 5,804,182 nonimmigrant visas, which is lower than the decade's peak of 7,588,778 visas in 2001 but higher than the decade's bottom of 4,881,632 visas issued in 2003 (see Figure 2). It was also lower than the 6,603,182 nonimmigrant visas issued in 2008. Source: The Department of State, Report of the Visa Office 2009, Table XVIII. Nonimmigrant Visas Issued by Nationality. Available online. The vast majority (70.2 percent) of nonimmigrant visas issued in 2009 were temporary business and tourist visas (B-1, B-2, BCC, and BCV visas). The next largest groups were F-1, F-2, and F-3 academic student and family of academic student visas (6.1 percent) and J-1 and J-2 exchange visitors and their spouses and children (6.0 percent). Disaggregated by region of origin, the majority of temporary visas in 2009 were issued to foreign nationals from Asia (36.3 percent) and North America (22.2 percent, including Central America and the Caribbean), followed by South America (19.9 percent), Europe (15.6 percent), Africa (5.0 percent), and Oceania (0.8 percent). Compared to 2008, the share of temporary visas issues to foreign nationals from Africa, North America, and South America increased while the share issued to foreign nationals from Asia and Europe decreased. The share issued to foreign nationals from Oceania remained the same. In the United States, the main difference is the person's location at the time of application. For more information, see the Department of State publication Report of the Visa Office 2009. In 2009, 74,602 individuals were admitted to the United States as refugees. This figure represented a 24.1 percent increase compared to the number in 2008 (60,107). It was the largest number of refugees admitted since 1999 (85,285). Nationals of Iraq, Burma, and Bhutan represented 67.7 percent (50,492) of all refugees admitted in 2009. Altogether, nationals of the top 10 countries made up 93.6 percent of all refugee arrivals in 2009. In addition to the top three, these countries include Iran, Cuba, Somalia, Eritrea, Vietnam, the Democratic Republic of Congo, and Burundi. The number of foreign born who were granted asylum (both affirmatively and defensively) in 2009 was 22,119. This represents a small decrease over the corresponding number in 2008 (22,838). The number of foreign born granted asylum both affirmatively and defensively has declined steadily since 2006. Over 6,100 persons from the People's Republic of China, 1,113 from Ethiopia, and 998 from Haiti were granted asylum, accounting for 37.2 percent of all individuals who received asylum status in 2009. Those granted asylum from Colombia (993), Iraq (908), Nepal (671), Venezuela (583), Guatemala (513), Russia (494), and Egypt (481) accounted for another 21.0 percent. Together, nationals of these seven countries made up over half of all individuals who received asylum status in 2009. How many apprehensions were there in 2009? 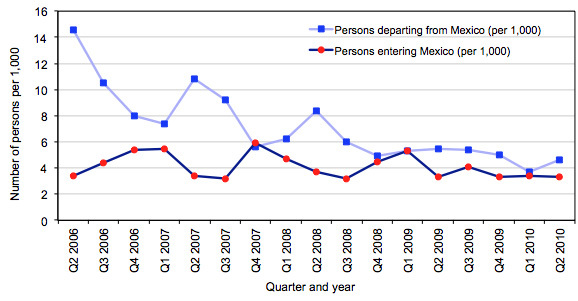 How many people were deported in 2009? According to Pew Hispanic Center estimates, there were 11.1 million unauthorized immigrants living in the United States in March 2009. The size of the unauthorized population appears to have declined since 2007. However, this finding is inconclusive because of the margin of error in the estimates, which are based on data from the Census Bureau's Current Population Survey of 50,000 households each month. The flow of unauthorized immigrants grew more slowly (by about 300,000 per year) between March 2007 and March 2009 than it did between March 2005 and March 2007, when the population grew by about 550,000 per year. For the period between March 2000 and March 2004, the population grew by about 850,000 per year. Reversing a long-term trend, the flow of unauthorized immigrants fell below the flow of lawful permanent residents between 2005 and 2008. Unauthorized immigrants made up 28.0 percent of the nation's foreign-born population, about 3.7 percent of the entire U.S. population, and 5.1 percent of U.S. workers. Approximately 47.0 percent of the nation's unauthorized immigrants have arrived since 2000. Read Pew Hispanic Center's most recent fact sheet on unauthorized immigrants. Learn more about the Current Population Survey on the Census Bureau website. In January 2010, the Department of Homeland Security released estimates of the unauthorized immigrant population in the United States as of January 2009. See the Department of Homeland Security estimate. The vast majority of undocumented immigrants are from Mexico and Latin America: 60.0 percent (6.7 million) from Mexico, 12.0 percent (1.3 million) from Central America, 5.0 percent (575,000) from South America, and 3.0 percent (350,000) from the Caribbean. An additional 11.0 percent (1.2 million) are from South and East Asia, 4.0 percent (475,000) from Europe and Canada, 1.0 percent (150,000) from the Middle East, and the remaining 3.0 percent (350,000) come from Africa and Oceania. About 5.1 million children in 2009 had at least one parent who was an unauthorized immigrant, according to the Pew Hispanic Center. Of this group, 79.0 percent (4.0 million) were U.S. citizens by birth and 21.0 percent (1.1 million) were unauthorized immigrants themselves. The number of children with unauthorized immigrant parents has nearly doubled since 2000, when there were just 3.6 million such children. However, over the same period, the number of unauthorized immigrant children declined from 1.5 to 1.1 million, while the number of U.S.-born children with unauthorized immigrant parents grew from 2.1 to 4.0 million. In January 2010, the Department of Homeland Security released estimates of the unauthorized immigrant population in the United States as of January 2009. See the estimates. Read Pew Hispanic Center's fact sheet on unauthorized immigrants. Research in the United States and other countries indicates that, along with temporary migrant workers, flows of unauthorized immigrants are most closely linked to the economy and thus the ones most likely to fall in poor economic times. Data from the Pew Hispanic Center show that the annual flow of unauthorized immigrants from Mexico has declined from about 500,000 per year between March 2000 and March 2005, to about 325,000 per year between March 2005 and March 2007, and to about 150,000 per year between March 2007 and March 2009. Between 2008 and 2009, the unauthorized immigrant population from Mexico appears to have declined, although the change is not statistically meaningful. This finding is reinforced by U.S. Border Patrol apprehensions data and Mexican government surveys. However, the change in the unauthorized immigrant population from other regions of Latin America (excluding Mexico) did definitively decline in 2009 from 2.5 to 2.2 million people. The unauthorized immigrant population from other regions of the world beyond Latin America has remained stable between 2.0 and 2.3 million for much of the last decade. A second central story is that return migration remained the exception and not the rule throughout the recession. There has been virtually no change in return flows to Mexico. Data from Mexico's National Survey of Occupations and Employment (ENOE, according to its Spanish acronym) show that while outflows from Mexico have slowed dramatically, inflows of returning migrants have remained remarkably stable in recent years. Read the most recent press release from Mexico's National Institute of Statistics and Geography (INEGI) reporting international migration trends (in Spanish). Additional press release here. For more information on how various immigration streams responded to the financial downturn in the United States and around the world, read MPI's 2010 report Migration and Immigrants Two Years after the Financial Collapse: Where Do We Stand?. There were over half a million apprehensions in 2009. The overwhelming majority, 97 percent, were along the Southwest border. The total number of apprehensions reported by the Department of Homeland Security steadily increased during the 1990s, from 1,169,939 apprehensions in 1990 to 1,814,729 in 2000. Between 2000 and 2005, the number of border apprehensions fluctuated — decreasing between 2000 and 2003, before increasing in 2004 and 2005. Since 2005, however, the number has steadily decreased from 1,291,142 to 613,003 in 2009. The 2009 figure is the lowest since 1972, when 505,949 unauthorized immigrants were apprehended. The United States deported nearly one million unauthorized immigrants in 2009. The total number of unauthorized immigrants deported rose from 1,052,572 in 1990 to 1,864,343 in 2000 before declining to 973,396 in 2009. The 2009 total was the lowest number in two decades; 865,317 individuals were deported in 1989. However, the number of removals (forced deportations) rose throughout the period from 30,039 in 1990 to 188,467 in 2000 and 393,289 in 2009 — the largest number on record. By contrast, voluntary returns first increased over the period, from 1,022,522 in 1990 to 1,675,876 in 2000, but then declined to a record low of 580,107 in 2009. Note: Removals are the compulsory and confirmed movement of an inadmissible or deportable unauthorized immigrant out of the United States based on an order of removal. An unauthorized immigrant who is removed has administrative or criminal consequences placed on subsequent reentry owing to the fact of the removal. Returns are the confirmed movement of an inadmissible or deportable unauthorized immigrant out of the United States not based on an order of removal. Most of the voluntary departures are of Mexican nationals who have been apprehended by the U.S. Border Patrol and are returned to Mexico. View the Department of Homeland Security's July 2009 Immigration Enforcement Actions: 2009. Note: The government fiscal year runs from October 1 to September 30. All figures for immigration control and enforcement given here are for the government fiscal year. Funding for the Border Patrol, at the time part of the Immigration and Naturalization Service in the Department of Justice, increased 519 percent between 1986 and 2002, from $268 million to $1.6 billion. The Border Patrol is responsible for enforcing 8,000 miles of U.S. land and water boundaries between legal points of entry (designated points where immigration officials can regulate entry). Following the creation of the Department of Homeland Security in 2003, the Border Patrol became part of Customs and Border Protection, an agency within the Department of Homeland Security. Customs and Border Protection's responsibilities also include regulating and facilitating international trade, collecting import duties, enforcing U.S. trade laws, and protecting U.S. agricultural and economic interests from pests and diseases. According to the Department of Homeland Security annual budgets from various years, the total Customs and Border Protection budget (gross discretionary and mandatory, fees, and trust funds) was $5.9 billion in 2003. The agency's budget increased 32 percent to $7.7 billion in 2007 and another 20 percent to $9.3 billion in 2008. In 2009, it rose to $11.7 billion, before declining slightly to $11.4 billion in 2010. President Barack Obama has requested $11.2 billion for 2011. Immigration and Customs Enforcement is the investigative branch of the Department of Homeland Security and is responsible for enforcing immigration laws. In 2003, the total budget for Immigration and Customs Enforcement was $3.3 billion, which rose 44 percent to $4.7 billion in 2007 and another 8 percent to $5.1 billion in 2008 (gross discretionary and mandatory, fees, and trust funds). In 2009, it increased to $6.1 billion, and in 2010 it decreased to $5.7 billion. The president has requested $5.8 billion for 2011. For information on border-enforcement spending, read MPI's DHS and Immigration: Taking Stock and Correcting Course. Learn more about immigration enforcement spending in the February 2007 Policy Beat. See the Department of Homeland Security website for more on the agency's budget. To learn more about the responsibilities of the various Department of Homeland Security agencies, read Who Does What in U.S. Immigration. The number of Border Patrol agents doubled from approximately 9,000 in 2001 to 19,726 in 2008. In 2009, the number of Border Patrol agents increased to 20,163. The Border Patrol expects to hire 44 new agents in 2010 and maintain constant staffing levels around 20,000 in 2011. Read the Department of Homeland Security's 2010 Budget in Brief. Note: The government fiscal year runs from October 1 to September 30. All naturalization figures from the Department of Homeland Security are for the 2007 fiscal year (October 1, 2007 to September 30, 2008). How many immigrants naturalized in 2009? How many foreigners became U.S. citizens through military naturalization? Of the 38.5 million foreign born in the United States in 2009, 16.8 million (43.7 percent) were naturalized citizens according to the 2009 American Community Survey estimates. According to data from the Department of Homeland Security, U.S. Citizenship and Immigration Services naturalized 743,715 lawful permanent residents in 2009. From a historical perspective, the number of naturalizations has increased dramatically in recent decades. On average, 141,000 lawful permanent residents naturalized each year between 1970 and 1979, 205,000 on average per year in the 1980s, 498,000 in the 1990s, and 629,000 during the 2000-2008 period. The number of naturalizations reached an all-time record high in 2008 (1,046,539) before falling by 28.9 percent in 2009. However, compared to 2007, the number of naturalizations in 2009 increased by 12.6 percent. The high number of naturalizations in 2008 can be explained at least in part by the presidential elections, which immigrant advocacy groups used in their ongoing campaigns to promote naturalization, and by the 80.0 percent increase in naturalization fees (from $330 to $595) scheduled for the end of July 2007 and announced in January 2007. For more background information on naturalization trends, see the August 2009 Spotlight on Naturalization Trends. In 2009, 7,100 foreign born military personal naturalized as U.S. citizens on U.S. soil, overseas, or on board Navy ships. This was the largest number of military personnel naturalized as U.S. citizens in any single year since the end of the Vietnam War. Of those who naturalized in 2009, 15.0 percent were born in Mexico (111,630), 7.1 percent in India (52,889), and 5.2 percent in the Philippines (38,934). Nationals of these three countries, together with those from China (37,130), Vietnam (31,168), Cuba (24,891), the Dominican Republic (20,778), El Salvador (18,927), Korea (17,576), and Colombia (16,593) accounted for 49.8 percent of all naturalizations in 2009. In 2009, 24.2 percent of those who naturalized lived in California (179,754), 11.9 percent in New York (88,733), and 11.1 percent in Florida (82,788). More than 15.0 percent of all those who naturalized in 2008 lived in the greater New York metropolitan area (112,801), 11.3 percent in the greater Los Angeles metropolitan area (84,061), and 7.3 percent in the greater Miami metropolitan area (54,061). These areas, together with the greater Washington DC metropolitan area (4.4 percent), Chicago (3.6 percent), San Francisco (2.8 percent), San Bernardino, CA (2.6 percent), and Houston (2.5 percent) were home to 50 percent of new U.S. citizens in 2009. How long are naturalization processing backlogs? In 2009, foreigners naturalizing as U.S. citizens waited on average 4.5 months for their applications to be processed. The average wait time declined from around 8.8 months in 2008. Two types of backlogs impact issuance of green cards. The first is due to visa availability. The government caps employment-based permanent visas for foreign workers and their families, for example, at 140,000 per year. Also, no country can receive more than 7 percent of the total number of annual worldwide visas (approximately 25,600 visas). Once the Department of State grants a visa to an immigrant, Citizenship and Immigration Services and the Federal Bureau of Investigation conduct background checks. As of November 10, 2010, Citizenship and Immigration Services was processing some family-related visas applications filed as far back as January 1988, and it was still processing some employment-related visa applications from January 2002. A U.S. citizen wishing to sponsor an unmarried adult child from Mexico, for instance, has to wait more than 17 years before the application will be processed, and a U.S. citizen wishing to sponsor a sibling from the Philippines has to wait 22 years (see Table 1). However, recent years have witnessed dramatic reductions in the backlogs for certain categories of immigrants, particularly the immediate family members (spouses and children) of lawful permanent residents. Note: In this table, "current" means that the visa numbers are available for all qualified applicants. Source: U.S. Department of State, Visa Bulletin, December 2010. Available online.